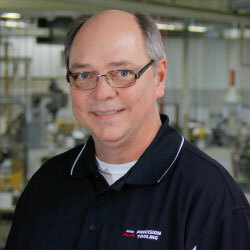 The best way to reduce press brake setup time is to look for ways to make setting up easier. Mate’s Swing™ punch holders do just that; reduce time by making setups easier and faster. 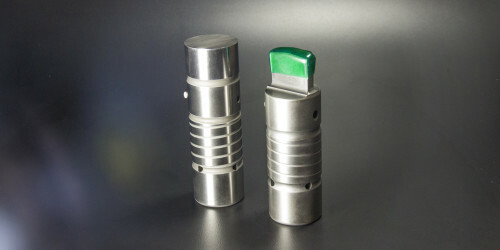 European style punch holders have a lot of benefits, but they don’t offer an efficient way to load punches from the front of the brake, which often times is the faster and most convenient method. The Swing™ punch holder makes it easy to safely remove or load punches anywhere along the length of the bed with its unique multi-purpose clamp plate capable of locking open and automatically snapping closed when the punch is inserted. To remove the punches from the front of the brake, simply loosen the single clamp plate bolt half a turn and pull forward on the bottom of the punch. This places the Swing™ clamp plate locks into the open position allowing for easy removal of the punches. When installing punches while the clamp plate is open, the tang of the punch trips the release mechanism (behind the clamp plate) and snaps the clamp plate into the closed position. This holds the punch while still allowing re-positioning of the punch. If you chose the load the punches from the side, use the release mechanism above the clamp plate to snap closed. When all of the punches are positioned where you want them simply tighten the single clamp plate bolt on each holder. The punches are firmly clamped, seated, and ready to bend, eliminating the extra step of putting the tools under pressure to seat the punches. SwingTM punch holders are available for European style brakes in heights of 3.937” (100mm), 4.724” (120mm), and 5.906” (150mm). Rear clamp plates are also available to use punches in the forward or reverse position.